There have been many studies on how non-verbal behaviour (body language such as facial expressions, gestures etc) impact communication. Back in the 1950s, Dr Ray Birdwhistell was one of the first to suggest that no more than 30% to 35% of the social meaning of a conversation or an interaction is carried by words. (There were others before him but Dr B has by far the coolest name, so we like him best). 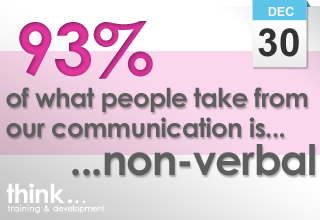 If this is true, it means that a staggering 93% of what people take from our communication is non-verbal. If it’s important to you to give a good impression when you are addressing others, have a listen to the podcast for some tips. 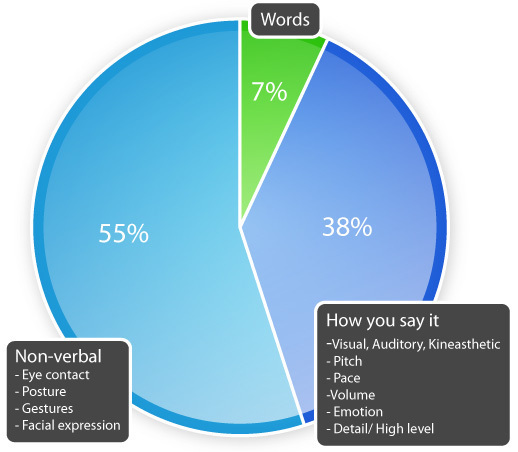 If, having listened to the podcast, you’d like to know more about Visual, Auditory or Kinaesthetic words and phrases, Email Us and we’ll send you some information, including a questionnaire that will enable you to pinpoint your own preferences. If you’d like to increase your personal impact– have a look at our Communication Skills or Advanced Presentation Skills courses or Contact Us to talk through how we can help.